2007 was an interesting year. 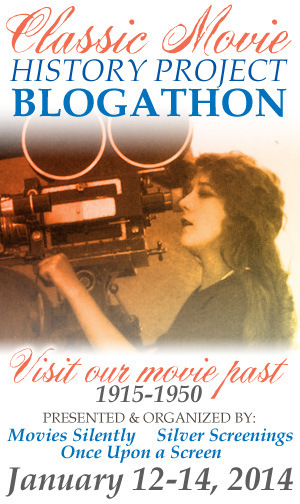 I started this blog. I was impressed to find that people actually read it and occasionally make comments. 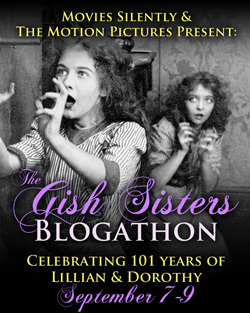 Bloggers love comments. I thank all the people who have let me know what they think. 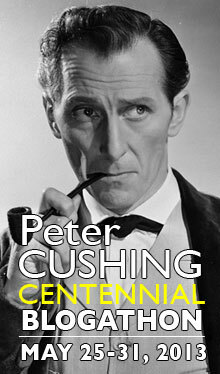 Coincidentally, this is also my 100th post. 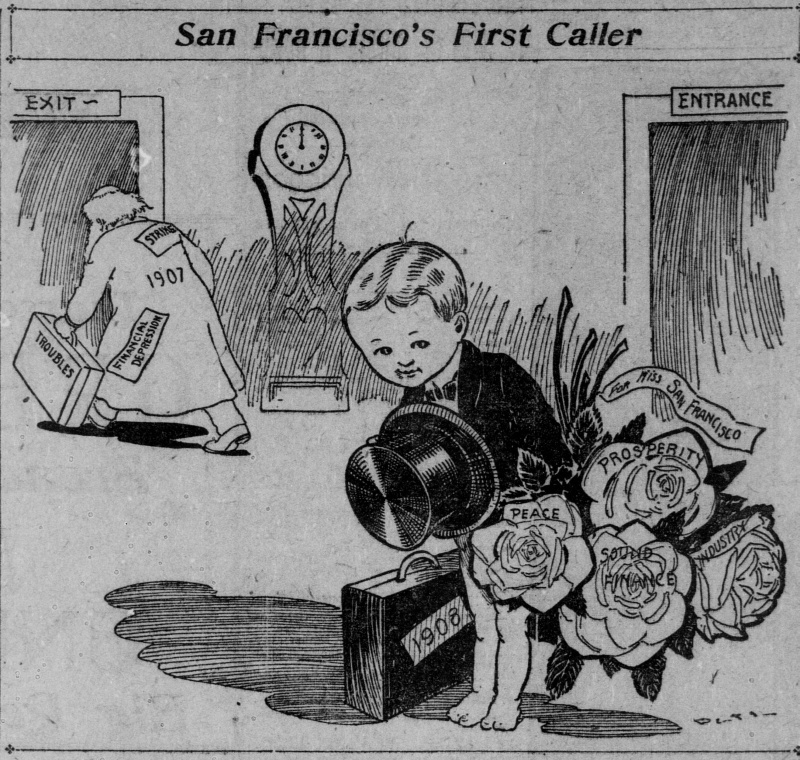 This cartoon is from the 01-January-1908 San Francisco Call. I read Michael Chabon's The Yiddish Policemen's Union. It is set in Sitka, Alaska, in an alternate history. Jerusalem fell in 1948 and the state of Israel was destroyed. The United States reluctantly allowed the world's Jews to settle in a federal district established in Sitka. The story takes place in 2008, when the special district is due to be eliminated. Everyone in Sitka is worried about the future. The main character is Meyer Landsman (good last name), a homicide detective. He lives in a seedy hotel on Max Nordau Street (thank Heaven for wikipedia -- I didn't remember who Max Nordau was). 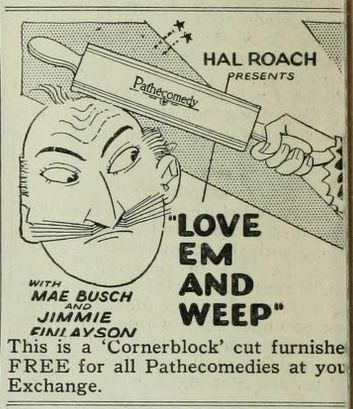 Another player, a junkie chess player, is murdered and Landsman feels a need to solve the case, even though he is encouraged not to. 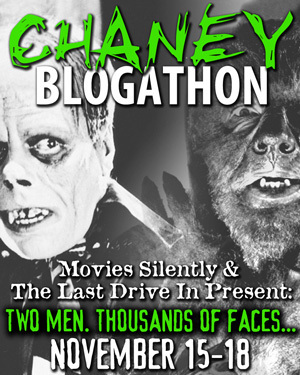 I liked the imaginary society Chabon created. It felt real. The plot got a little too complex for my taste, but I enjoyed the book to the end. It was very cold today. This morning the outside temperature indicator in my car said it was 35 when I left the house and 33 when I got to the beach. A co-worker later told me he believes the thermometer in that model is three degrees high. I got out for a walk at lunchtime. I spotted the double decker bus that Muni has been testing. It was laying over on Mission at Spear. I went on to the Market Street Railway's museum at Don Chee Way. I took a photo of the Wiley Birdcage stop light. I helped direct the donor to the MSR. I bought the 2008 calendar. I went on to California and Drumm to look for a decorated car. No luck. Here is a special Christmas edition. I took this photo on 25-December-2007. 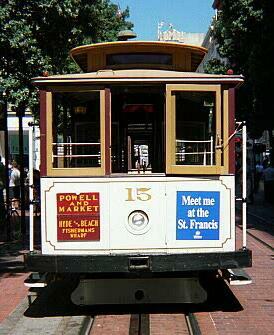 I took this photo of Powell Street cable car 9 at Hyde and Beach on 08-December-2003. Yesterday was a fun day. We were all off of work and school, so we drove to Fifth and Mission. We caught cable car 16 as it rolled off the turntable and rode it out to Hyde and Beach. My wife and daughter got a seat after about Sutter. The California Street line was down. We walked around Fisherman's Wharf and out to Pier 39. The sea lions were enjoying their leisure. We walked back to Jones and they caught an F car back to Market. I walked to the Argonaut Hotel. I'll go into more detail on my cable car site, but the people of the Cable Car Division hosted about 150-200 seniors for a nice lunch. This was the 25th annual event. 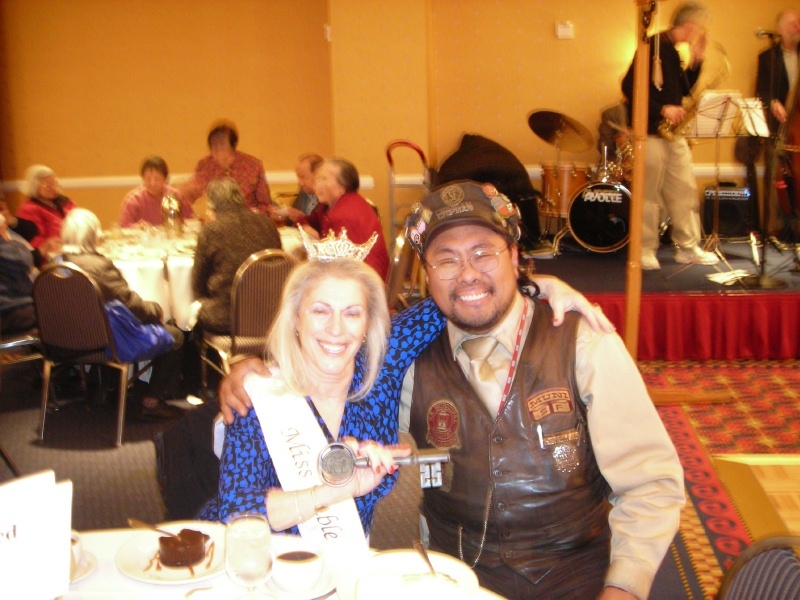 I got to sit at a table with Miss Cable Car 1973, Barbara Walsh. Here she is with her key to the city and co-chair gripman Val Lupiz. Yesterday morning it was raining as I rode the DX into the city. The bus I usually ride in the morning takes Ninth Street. When we turned onto Mission, the driver said "Looks like there's a fire up ahead." We could see several sets of flashing lights. She turned down Eighth to Folsom and then back up Seventh. We had a bad time turning back onto Mission from Seventh. The fire was between Seventh and Eighth, on the south side of the street. I learned later that it was the Knights of the Red Branch building which was burning. At lunchtime, I walked in the light rain to the Borders by the ball park to get gift cards for the members of my team. Then I handed out my Christmas cards. When I left work to catch the bus home, a lady at the stop said that Mission was still closed and the building was still burning. This was a DX that takes Sixth Street, so we didn't have to detour, but traffic was terrible. The DPT people were turning traffic off of Mission onto Sixth rather than Seventh, I suppose because Sixth has two-way traffic. This morning when the alarm went off, KCBS said Mission was still closed. The fire had burned all night. I surmised that the fire department was afraid the building was going to collapse. The Chronicle website confirmed that it is going to have to be demolished. This morning the driver went down Folsom to Sixth and over to Mission. That worked much better. Today I spent the day building a new desktop at work. My old one died two weeks ago and I have been using my laptop, which is not as good ergonomically. I didn't finish installing everything I need, but I made a good start. At lunchtime, I went to Patrick's Office Supplies and See's Candy to buy stocking stuffers. When I left to come home, I caught a Tenth Street DX. The driver turned on Sixth and went over to Howard, then straight out Howard to Tenth. Traffic was terrible on 101. I took the photo at the Linda Mar Park and Ride lot on 07-August-2007. 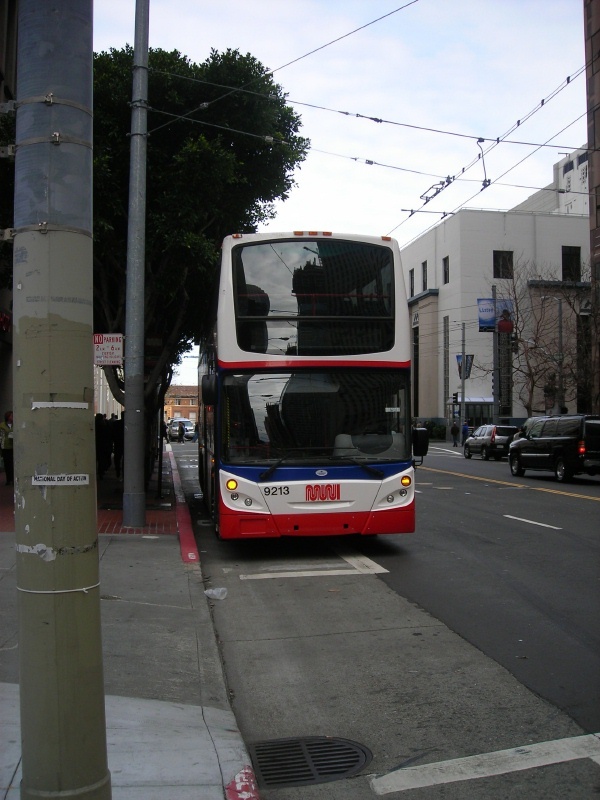 It shows Gillig Phantom 40-foot low floor bus number 316. I sometimes mention that I enjoy the look of pre-WWII racing cars. Here we have Gus Seyfried, who drove the "rakish" steam-powered White Flier (shouldn't that be Flyer?) 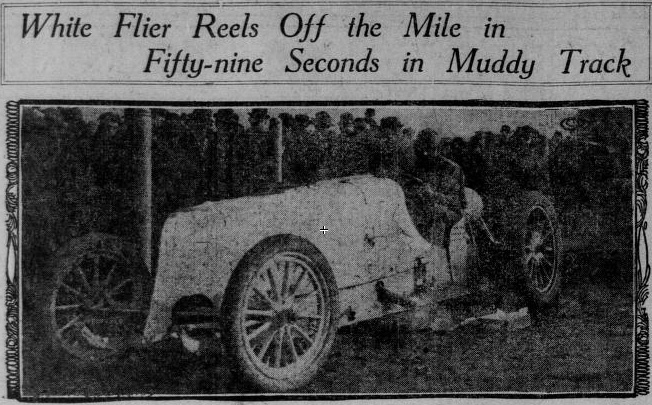 to a 59 second mile on the muddy track at Tanforan on 06-December-1908. Barney Oldfield could not do better than 1 minute, 3 seconds. Seyfried was from the area. I like the look of the car's front end. Note the steam exhaust pipe ahead of the cockpit. During a later qualifying heat, a "defective pilot light" put the car out of commission. This is from the 07-December-1908 San Francisco Call. 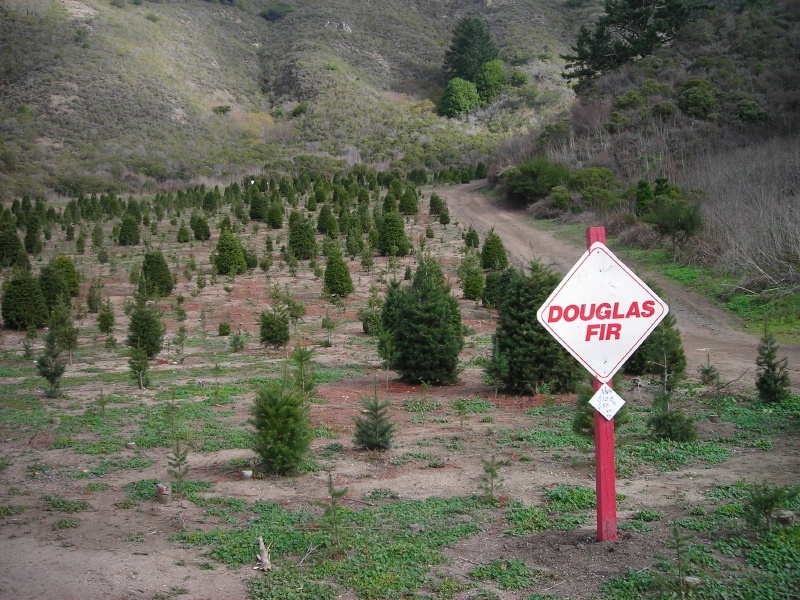 Today we drove to Half Moon Bay to cut our Christmas tree at Santa's Tree Farm. We chose one that was somewhat thinner than our usual tree. 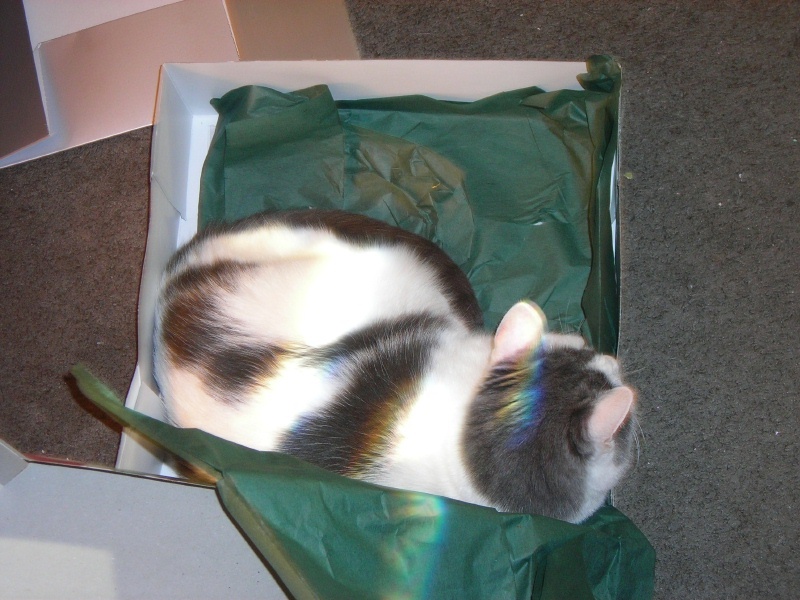 It was a lot easier to fit in the car, set up, and decorate. Tomorrow I place the train tracks. I was surprised when the guy at check out said that this was their last weekend for the season. When we drove in, we were behind their rubber-tired train. A snowman and a reindeer stood sat in the caboose. The snowman had to hold onto his head. I wish I could have taken a photo. Walter Rice, whom I am proud to have called a friend, passed away this week. He was what used to be called a man of parts. Walter, a native of San Francisco, was a PhD, Associate Dean and Professor Emeritus of Economics at Cal Poly San Luis Obispo, a historian who has written on many topics related to transit and railways, a die-hard fan of the San Francisco Giants, and a keeper of goats. This list covers only a small part of his accomplishments. I remember him as a gentleman, a man of great vitality, a good guy who took an interest in people of all sorts, a family man, and a person who lived to share his great knowledge with others. Walter and his wife Laurie were kind hosts to the many visitors who turned up at their home, including me and my family. I was honored that he made so many contributions to my cable car website (http://www.cable-car-guy.com/). I highly recommend his interview with Mrs Barbara Kahn Gardner, the daughter of Samuel Kahn, President of San Francisco's Market Street Railway, the chronology, his articles about the Manx Electric Railway, the Isle of Man Railway, and the Great Orme Tramway, and the many pieces of information and images that Walter allowed me to use. I firmly believe that Walter had a long list of questions ready for when he would meet Andrew Hallidie, Henry Root, James W Harris, and Frank J Sprague. Charles Smallwood probably introduced them. Many people will miss Walter. We are lucky to have known him. 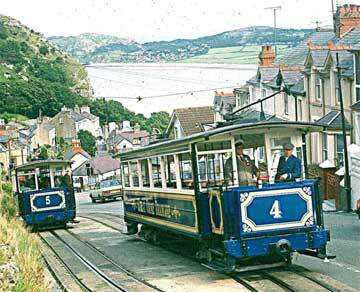 Walter Rice took the photograph of the Great Orme Tramway in Llandudno, Wales. All rights reserved. This blog is named after a series of articles written by Doctor P. H. Van der Weyde and published in Manufacturer and Builder Magazine in 1889 and 1890. The more I learn about Doctor P. H. Van der Weyde -- I'll share more about him in future posts -- the more I like him. 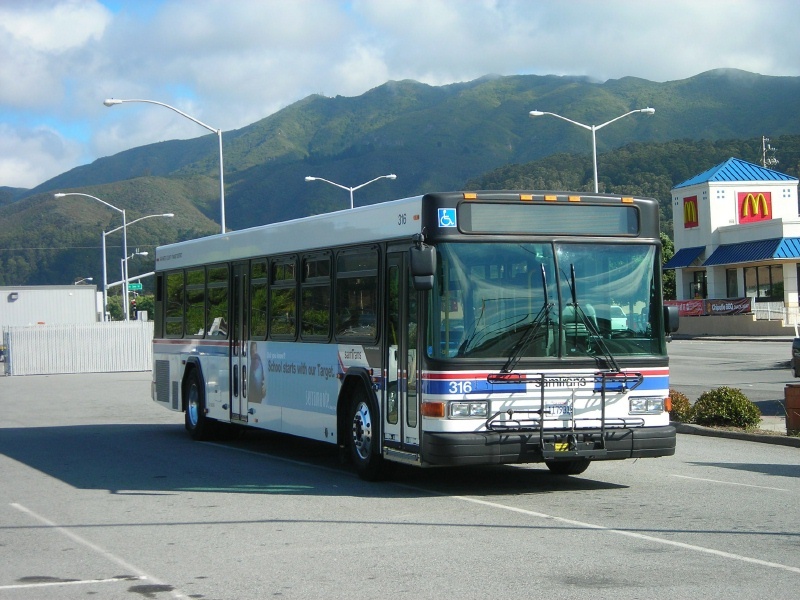 Here is an article he wrote about attempts to use compressed air to drive transit vehicles. In this period, people know that horse-powered railways were inefficient, but cable traction was expensive, steam power was not suitable for urban areas, and electric traction was still being developed. Lately an important problem has again been brought to public notice -- namely, the propulsion of street cars by means of compressed air, carried on the car itself. The solution of the problem requires the execution of two kinds of contrivances -- first, a reservoir strong enough to withstand considerable pressure, and, secondly, a motor machine to be put in operation by this pressure. The reservoir is by preference made in the form of cylinders, of say one or two feet in diameter, so that they can be placed under the seats of the car, and of a length sufficient to utilize all the space afforded. The motor is best placed under the floor of the car, now a common method in the electric trolley cars, while the regulating devices are on both platforms where the motorman performs his duty. 1. No dead weight of coal or fuel on board. 2. No dead weight of water, boiler, furnace, and other material which has to he stabled, the real primary motor, which is a stationary structure of large dimensions, and therefore economical, as the economy increases at a very large ratio as the engines are increased in size. 3. The compression of air is going on continually in the reservoirs, and is always connected with the gauges, so as to insure safety. 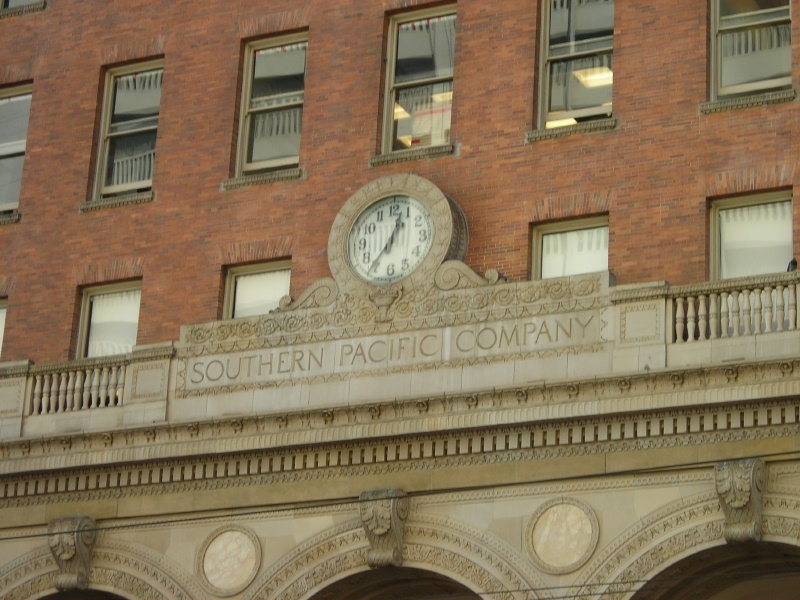 The first application of this principle was seen some six or eight years ago at the Harlem station of the Second Avenue Railroad. It was intended for the propulsion of trains, and the compressed air reservoirs consisted of two huge cylinders placed horizontally, with a space between, through which the engineer could see the forward track while standing on the motor, and having the train of cars behind. A few years later I saw some interesting experiments of thie same character at the Delamater works, where pipes were laid to quite a distance from the works, and at which pipes the cylinders could take up new supplies of compressed air without going back to the supply station. A syndicate has been formed to introduce this system of street transportation, so that we will have another additional method in practice. 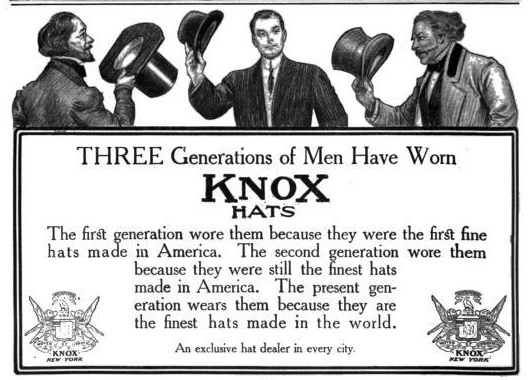 Looking for examples of the Waterless Knox, I sometimes come across ads for other products named Knox. This comes from a 1908 collection of McCall's Magazine. I always wear a hat or a cap when I go out, except to church. We had a fun day. We went to mass for the Feast of the Immaculate Conception at 8am. We drove downtown and parked at Fifth and Mission. We took a Milan car on the F down to the Ferry Building. At the Ferry Building, we met with the people who had the winning bid on a community support auction we had at work. 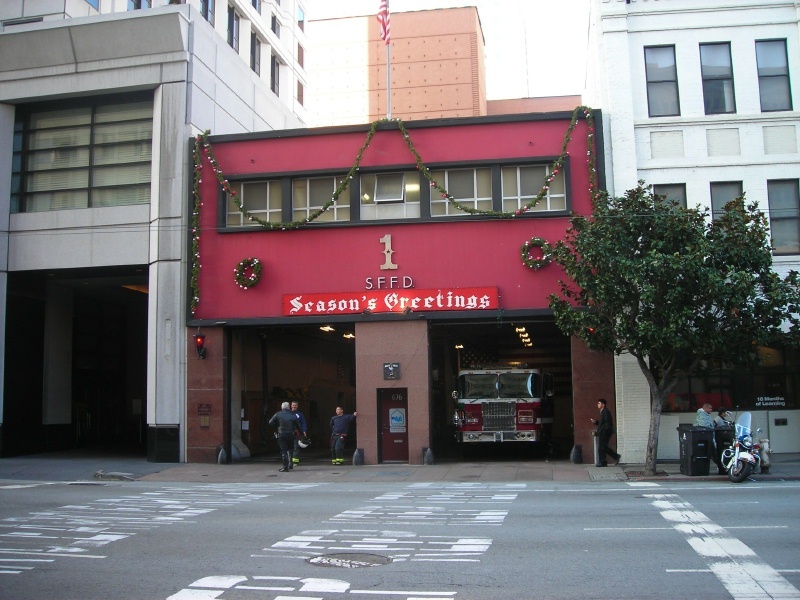 I offerred a history walking tour of downtown San Francisco. Out front, I talked about what it was like in the early 1930s, when the Ferry Building was the second busiest transit terminal in the world (Charing Cross in London was first). We went on to walk over by Mission Street, then back to Market, out California, over to Jackson Square, around to the Barbary Coast and Portsmouth Square. I enjoyed talking about history. We remarked on how many things we don't see when walking down the street. Then up to the Fortune Cookie Factory on Ross Alley. We went up the hill to Stockton, then through the tunnel and up to Burritt Street, then on to Powell and Lefty O'Doul's. I had a corned beef sandwich. That was fun. The winners were very nice people. We went back to Good Shepherd for 5pm mass. Two candles on the wreath. I always enjoy the first reading about the peaceable kingdom. Another view of Company One on Howard near Third Street. This time it is decorated for Christmas. In the 1940's there was a big decorating competition among firehouses. Nowadays, not all of them decorate. Company One does it every year. I took this photo today. I read an excellent article in the Chronicle today, "Elite craftsmen keep S.F. 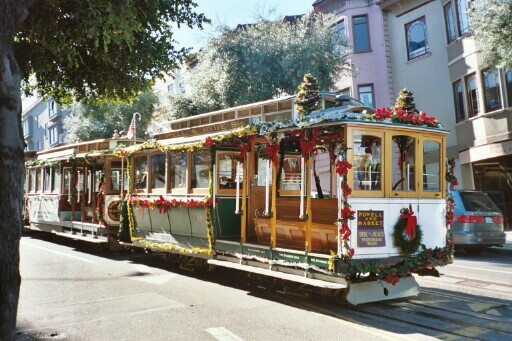 cable cars in good shape" by Rachel Gordon. I was pleased and surprised to see a link to my cable car site. The site visit statistics are going through the roof. The article talks about the building of new car 15. Here is a photo of the current car 15, which I took in September, 2001. The car, built in 1893, has been stored out of service at Pier 80 since 1984. New car 15 should go into service next year. Today we went downtown. My wife had to return something at the San Francisco Center. 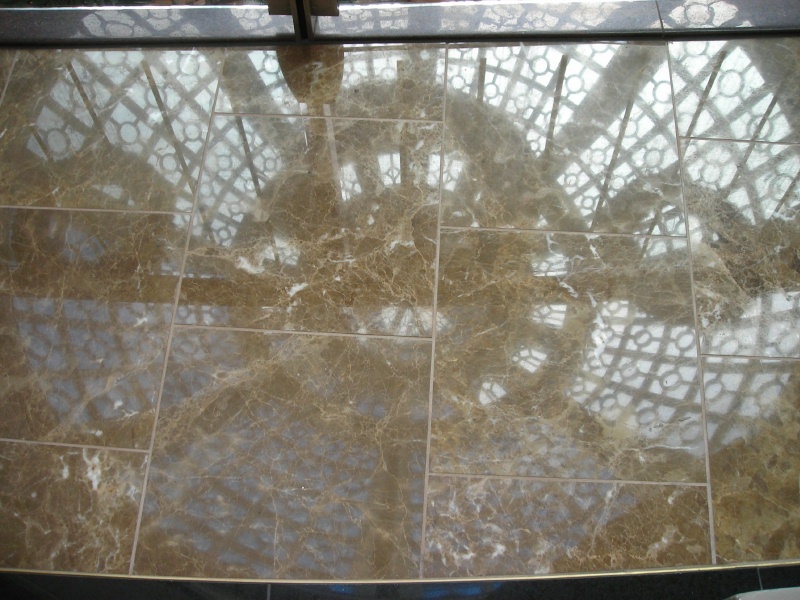 I took this photograph of the reflection of the Emporium dome in the pavement. We went on to Macys and looked at the animals in the windows. There was a black and white kitten sacked out on a bed; we could have taken him or her home. We went downstairs to Boudin's to get some lunch, but there were no tables available. We went across the street to Union Square to eat. There was some sort of dance show going on, and there were signs from the Dialogue Project (http://www.dialogueproject.net/) with hundreds of quotes on different subjects. I enjoyed reading them, especially the many quotes from Twain, Churchill, and Wilde. One I hadn't seen before was "Cogito cogito ergo cogito sum" ("I think I think therefore I think I am") from Ambrose Bierce. We went on out Grant and down to Portsmouth Square. Walking back along Kearney, we saw that the gripman on California Street car 49 had a parka with the hood up and a scarf across his face. I didn't blame him.